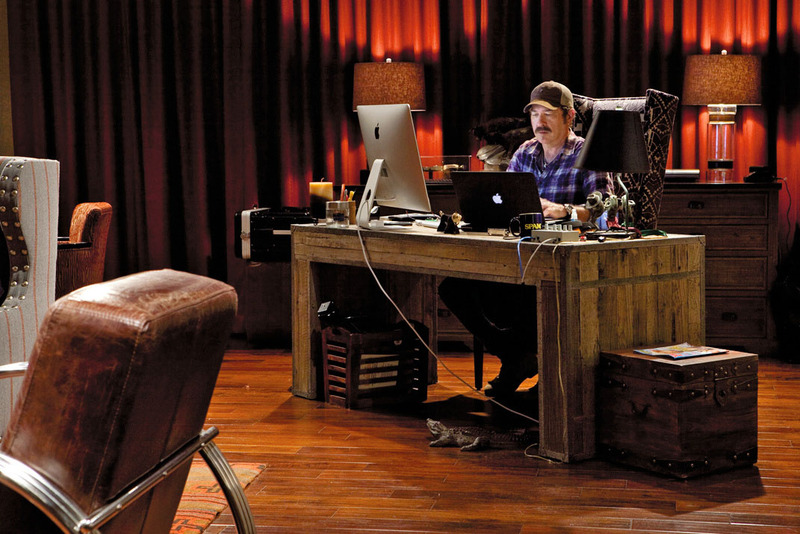 Kix Brooks looks quite comfortable in his new studio, seated behind a large trunk-shaped wooden desk where he is tapping on the keys of his Apple notebook. 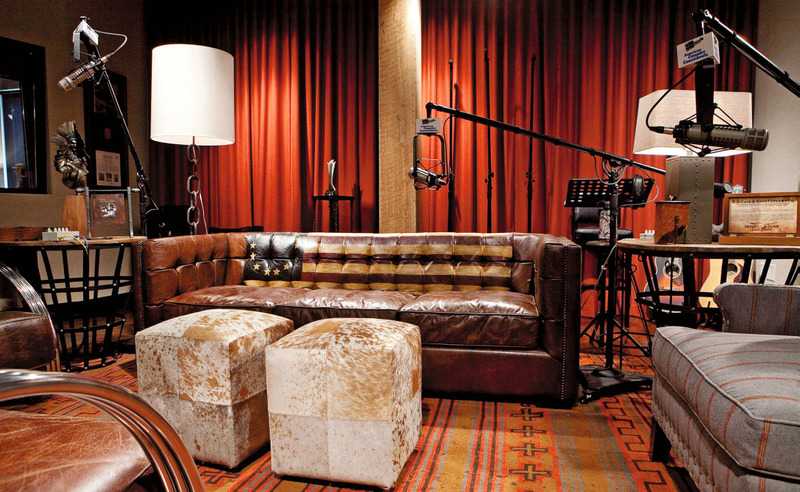 Located in the still-under-construction Cumulus Radio offices in the Rutledge Hill area just south of downtown Nashville, the singer and American Country Countdown host’s new space is warm and inviting, bathed in earthy tones, leather and eye-catching cowboy artifacts. It’s the kind of place you might like to kick off your boots, pour a scotch and settle in for an engaging chat with one of your buddies. Which is exactly what Kix, who has hosted the long-running countdown show for seven years, had in mind when he took over the program from radio legend Bob Kingsley. “Radio studios in general have somewhat of a dentist office attitude. [A] lot of Formica and that’s kind of it,” he says. “Having done a lot of interviews as an artist in those environments, it’s just chilly in general. 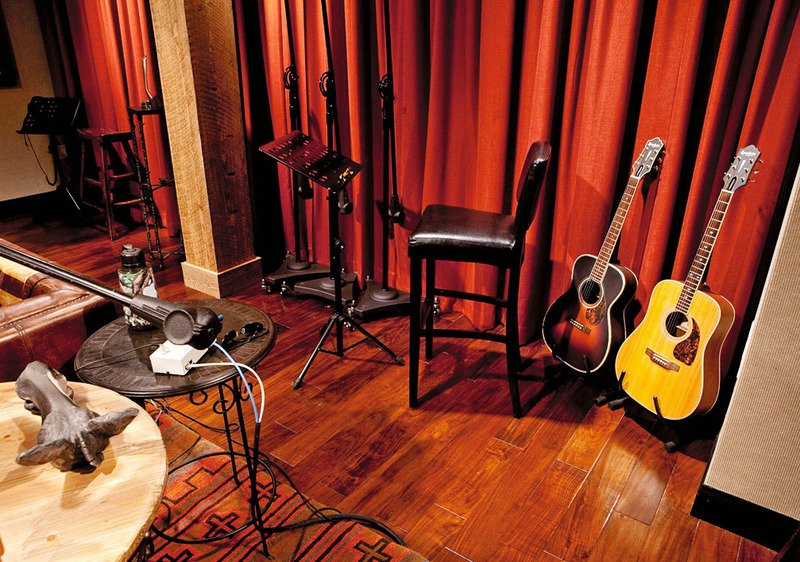 So I was determined with my first studio to create a living room/cowboy vibe, where people walk in and drop [their] shoulders a little bit.” Maybe it’s that casual, conversational atmosphere that helped Kix win the CMA’s National Broadcast Personality of the Year Award in 2009 and 2011, which he considers a “great honor,” knowing his radio peers voted for him to win. Kix’s method is merely to make his guests — many of whom are friends and tourmates from his days in Brooks & Dunn—feel comfortable when they visit. “We always sit down and just start talking about family or kids or whatever,” he explains. “I’m always rolling tape. The last thing they always say when we’re done is, ‘When are we gonna start?’” he says with a hearty laugh. “I’m like, ‘We’re done!’ I always tell them, ‘If you say anything that you’re not comfortable with, just give me a call if it comes into mind and don’t worry about that.’ As a result I’ve got a lot of really candid conversations that are special.” Kix admits that when he took over hosting duties in 2006 with the blessing of previous host Bob Kingsley, he had a lot to learn. ABC sent him to ESPN’s interviewing school, where he picked up some important tricks and methods for talking to his guests. Even still, he says, those early days were a bit touch-and- go. “I just cringe at the thought of even how bad it was when I got started. I didn’t even recognize my own voice on the radio!” he says, shaking his head. “And I was doing everything wrong, everything you can think of—every bad way of speaking, so much nervous energy that it was just out of control. It’s certainly a craft, like songwriting or playing guitar, that requires practice to master. And Kix, who is still touring and working hard on his post-Brooks & Dunn solo career (see sidebar) as well as being part owner in the Arrington Vineyards winery, has his hands in a lot of pies, so it’s sometimes very difficult. “I’m really jealous of radio personalities who get to do it every day, because Nice digs! The control room is where Lonnie Napier (inset above left) makes all the right cuts. I do a weekly countdown show,” he admits. “I still have my job as a record- ing artist, and I still tour and do other things. I realize when I sit back in that chair that I gotta get my legs back under me. I really respect the people that are great at radio and it really makes me want to be better at it.” It might be stressful, if Kix didn’t love doing it all so much. “Everything I’m doing right now, I’m doing be- cause it’s fun for me,” he says. “I wake up in the morning and just smile at all the stuff I’m gonna get to do every day. I pop that calendar open and it’s a full schedule, but I’m like, ‘OK, OK.’ It’s all good stuff.” With that, he returns back to his desk, looking comfortable as ever as he bangs out another e-mail.